If there ever was a time that is full of distractions, it's now. 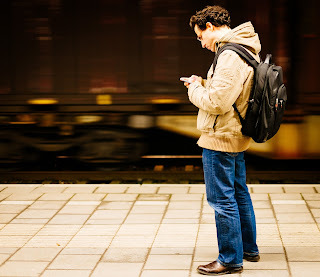 Go to any public place and you'll see people engrossed in their phones or tablets as they walk, drive, eat, converse… It's an era characterized by multi-tasking, by doing or trying to do a whole lot of things at once and by having our activity, focus, or thoughts repeatedly interrupted by beeps or ring-tones: "Gotta check my messages… Facebook… Twitter." I know from experience how easy it is to get swept along in a chain of replying, clicking on links, checking out just one more thing online. Before I know it 30, 45, 60 minutes have gone by. All of which makes Jesus' plea for us to watch and be alert to the signs of His near return all the more challenging. The everything's-going-well-so-let's-have-a-party attitude of the days before the flood - Matthew 24:38-39. The feeling that Jesus' coming and the day of accountability is still a long way off - Matthew 24:48-51. The failure to prepare ahead of time, so that the unexpected catches us without resources - Matthew 25:6-10. Absorption in the joys and problems of this life - Luke 21:34,35. Physical fatigue and exhaustion - Mark 14:34-41. Dullness because of apparent peace and safety - 1 Thessalonians 5:3. So what do we do to stay watchful, alert, and prepared for these end days? 1. We familiarize ourselves with the Bible's predictions for the end—that list we talked about yesterday, of signs that Jesus' coming is approaching. 2. We get mentally and spiritually prepared for society's increasing rejection of Christians and Christianity, even in so-called freedom-of-religion countries like Canada and the U.S.
3. We get serious about storing up some oil. We get to know our Bibles and memorize verses and passages against the day the Bible may be banned as a hateful and subversive book. 4. We stay alert in prayer as Jesus told His disciples in Gethsemane. Do you think I'm being alarmist? Can you think of more? PRAYER: Dear Jesus, I know my own distractibility. Help me to get on Your wavelength of watchfulness so I'm alert and equipped for Your return and the events that precede it. Amen.